transform your space not by imposing signature style; we at Avian define and refine client's requirements by providing personal attention and analysis, and exploring a wide variety of materials inorder to achieve both functional and aesthetic spaces. 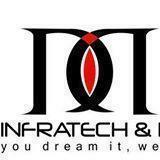 Divine infratech and decor conducts classes in Commercial Interior Designers and Residential Interior Designers. It is located in Indirapuram, Ghaziabad. It takes Regular Classes- at the Institute.